50.000 SCANS is part of an on-going project called Scanning Cinema that revolves around scanning moving images. By using a flatbed scanner and a monitor, the film is wrapped into a single frame that shows the passing time and duration in moving images. The scans are then placed into an animated film. 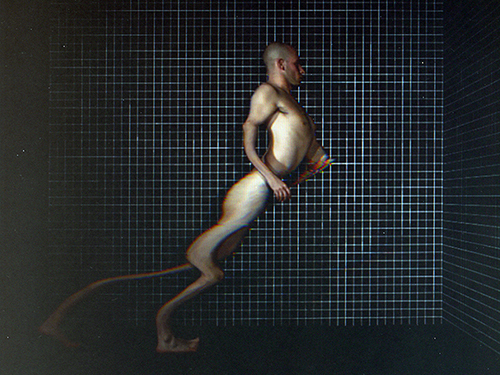 Working further on the findings of an earlier work, called Sculptural Movement: Chapter I & II, the video-essay 50.000 SCANS focuses on how choreography of the human body relates towards its registration technique and how it functions within the scanned reality. It continues the exploration of this scanned dimension and compares it with the beginnings of moving image and the capturing of movement within photography. The grid function as an analyzation tool and recalls the early photographic studies of Eadweard Muybridge and the chronophotography by Etienne-Jules Marey. Edited in blocks, called “Acts”, they start to function as a sort of fiche in an archive, with only the necessary technical and formal information on it. The soundtrack accompanying the images is based on the original recorded sound from the pre-scan registration. Then the sound is edited in a sort of self-created staircase-model that adapts to the scanned images in terms of time and images passing.